Manassas, VA– Motivational speaker, author and ministry leader Nick Vujicic will deliver an address on Tuesday, March 5, for the International Keynote at the NRB 2013 Convention & Exposition in Nashville, TN. Born without arms and legs, Vujicic has devoted his life to telling others about Jesus. As President of the non-profit organization Life Without Limbs, Vujicic travels around the world, speaking to large audiences about overcoming obstacles and finding hope in God. In 2013, Vujicic will travel to 27 countries to share his story through the ministry’s World Outreach. His daily two-minute radio program, also called Life Without Limbs, is heard on 300 radio stations. Vujicic writes about his journey from despair to restoration in the new bestselling book, Unstoppable: The Incredible Power of Faith in Action. 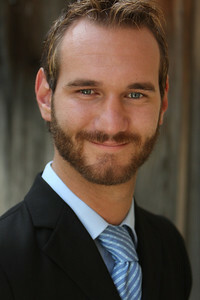 Born in Australia, Vujicic now lives in southern California. He and his wife are expecting their first child.